This might seem like a very ignorant comment, and it probably is, but I am not seeing an enormous gulf between practical and technical knowledge. After all, practical knowledge has to be certain. If it's practical, it works. Its success at achieving a given end is a fact of reality. I'm not sure Rand would've had much to complain about here at all. Jay, there is an enormous gulf. Very little knowledge in any one human is technical: the vast majority is practical. Our practical knowledge is self-assembled in our brains, rather than transferred from some other medium. Technical knowledge is metaphor that we can use to guide our fuzzy-logic learning. This is a widespread view in the education literature. I'll give you an example: how good are you at word definitions? There are lots of words where you'll find that you lack technical knowledge but have practical knowledge, gained through context. Doubtless there are many words that you mispronounce because you've never heard them, only have read them. Another aspect of the difference is the fact that often students are technically proficient, but practically incompetent. This is especially frequent in math (which I teach), where a student can solve quite sophisticated technical problems, but ask them to apply that knowledge to a real-world situation in a word problem and the students choke. And finally, another aspect is that technical knowledge can essentially stand alone, whereas practical knowledge is embedded in that vast morass of "common sense", metaknowledge of how things interact, what's appropriate when, etc. Thanks for the clarification. What I should have said was, an enormous gulf between practical/technical knowledge in Rand's mind. I agree with your assessment of each kind, but don't really see why Rand would've been up in arms about it. Interestingly, it's this very "common sense" which is the major, currently insurmountable stumbling block in developing A.I. too. Jay: "After all, practical knowledge has to be certain. If it's practical, it works." It's little more complicated than that. In the first place, it's always possible that a person's practical knowledge works because they are lucky. Moreover, whether something works is not a criterion that can be used to judge moral or aesthetic practical knowledge. Here's where the duality between technical and practical knowledge yields huge problems for Rand. As I noted in my post, Rand is an extreme foundationalist. She wants to justify everything she believes, including her moral beliefs, with "reason." 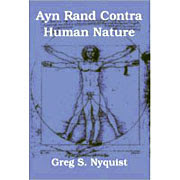 But if morality includes, not merely the technical knowledge embalmed in moral principles, but a practical knowledge version which only makes in appearance in moral conduct (or in the intuitive judgment of conduct), then Rand's desire for a rational morality built on "reason" can never be fulfilled. Since practical knowledge is tacit and inarticulable, deliberate conscious reason can never be used to justify it. Practical knowledge is, ipso facto, not compatible with any form of foundationalism. Practical knowledge morality cannot be justified or validated or rationalized or even understood by reason. At best, practical knowledge morality can be "appreciated" by other people who have attained a tacit mastery of it. Is practical knowledge really inarticulable? Let's stay with the cooking example. Hamburger Helper is a quick, easy favorite of mine. However, I routinely ignore some of the directions on the box. For example, it often says to add 2 cups of milk, but I know from experience to only add 1 or else the end result wont have the thick consistency I like. But that's far from inarticulable; I just explained it. It also seems to comport with Rand/Peikoff's definition of logic. I have integrated my experience of cooking with my knowledge of cooking, without contradiction. Maybe that's a bad example, but it sounds like exactly the type of practical, gained-from-experience knowledge that Oakeshott refers to. Your example with the hamburger helper doesn't involve practical knowledge, precisely because it can be articulated and stated in the form of a recipe. Practical knowledge would be akin to what my mother does when she makes cornbread. She has some kind of special way of mixing the cornbread which enables it to rise in the oven. When I follow the same recipe, the result is disastrous: the cornbread remains flat. My mother blames my failure on the fact that I have over-mixed the cornbread: I need to mix and "fluff" it. But when I try that, I simply the cornbread still remains flat, only this time it's unmixed as well. I haven't been able to hit on the secret of doing it, because that secret cannot be explicated in words. Explicit conceptual knowledge is limited in the depth and clarity of what it can express. Some aspects of reality are simply too deep, too complicated, too subtle to be adequately expressed in words. Fortunately, the cognitive unconscious enables us, at least on a practical, functional level, to grasp this knowledge that is too deep and subtle for words.